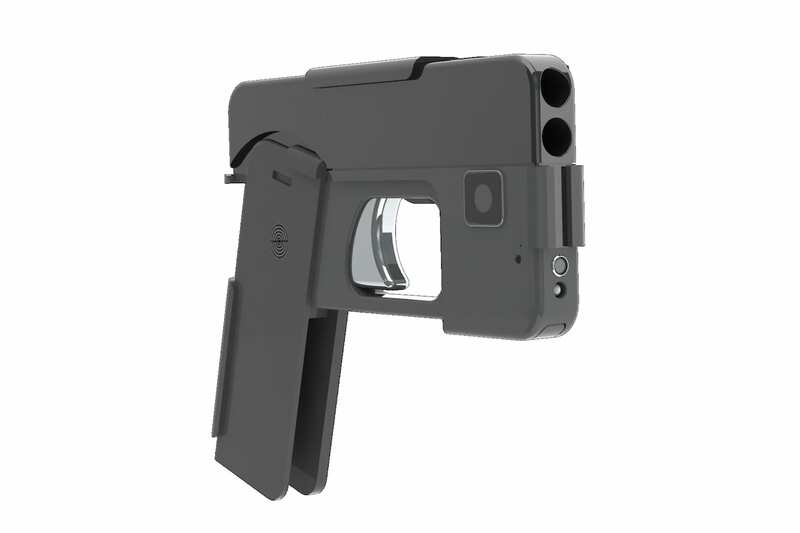 Just when you thought the world wasn’t dangerous enough already, someone has decided to invent a gun that looks exactly like a smartphone. Yeah, really. Minnesota-based manufacturer Ideal Conceal have made a double-barrelled pistol, which can carry two bullets and even has laser sights. 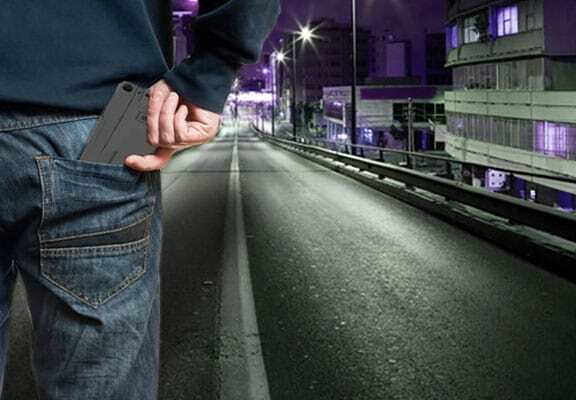 The .380 calibre handgun can be folded up to look like your bog-standard smartphone and and is expect to go on sale in the U.S. in the coming months, Business Insider UK reports. According to its manufacturer, it has been designed to ‘hide in plain sight’ and easily fits into a purse or back pocket, making it ‘virtually undetectable’. Terrifying, basically. European police have now been warned to remain vigilant as it’s expected to be imported illegally into the continent after its release. The pistol was originally supposed to launch in 2016, but an updated post by founder Kirk Kjellberg on January 5th revealed that they’re currently experiencing production delays. Apparently they’ve already received 12,000 pre-orders for the handgun, which costs $395 (£325) and it’s due to begin shipping some time over the next couple of months. Surely the invention of something like this will only make it harder for police to deal with the real criminals out there? Just a thought. Turkish police have arrested the main suspect in the New Year’s Eve attack on a nightclub in Istanbul after a manhunt lasting more than two weeks. Abdulkadir Masharipov is believed to have opened fire at Reina nightclub, killing 39 and wounding 69 others. The city’s governer, Vasip Sahin, said the suspect had confessed to the attack and that his fingerprints matched those found at the scene. 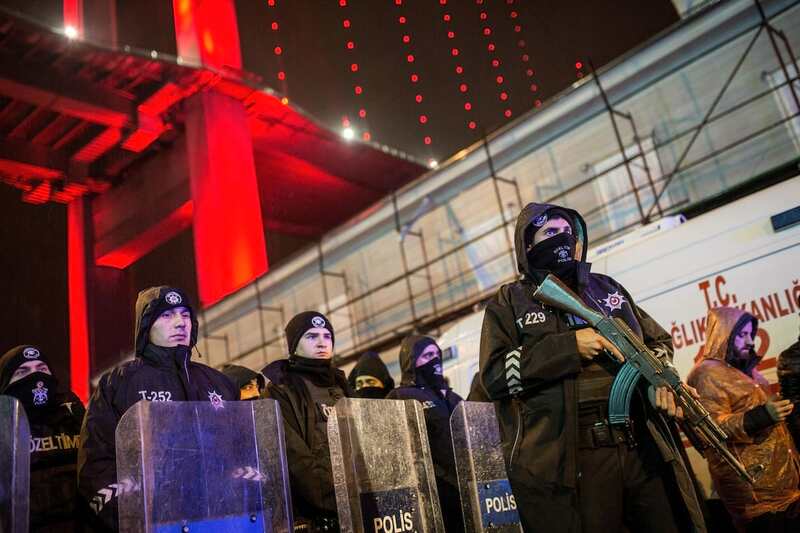 According to local media, the Uzbek national was arrested after a raid on a home in the Istanbul’s Esenyurt district. He was reportedly found with his four-year-old son. On January 1, the attacker shot his way into the nightclub before opening fire with an automatic rifle, reloading his weapon half a dozen times. He fired randomly at people celebrating the new year and shot the wounded laying on the ground. Citizens of Israel, France, Canada Tunisia, Lebanon, India, Belgium, Jordan and Saudi Arabia were among the victims. Dozens more were injured. Numan Kurtulmus, the Turkish deputy prime minister, today congratulated police on capturing the suspect to whom he referred as ‘the perpetrator’. 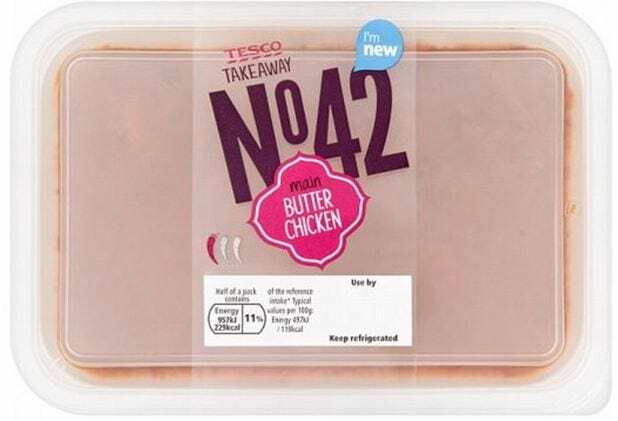 Gargantuan supermarket chain, Tesco, have issued an ‘urgent recall’ of some of their ready meals after it emerged they may contain nuts that were not specified on the label. Specifically, the ready meals in question are the 385g butter chicken dishes with a use-by date between 24/01/2017 and 25/01/2017. The meals may have been contaminated by cashew nuts despite the fact that nuts are not featured on the list of ingredients. So far two batches have been found to contain undeclared cashew nuts, reports the Daily Mail. If you have bought the products and have an allergy or intolerance to cashew nuts, do not eat it. Instead return it to the nearest Tesco store for a refund (no receipt is required). 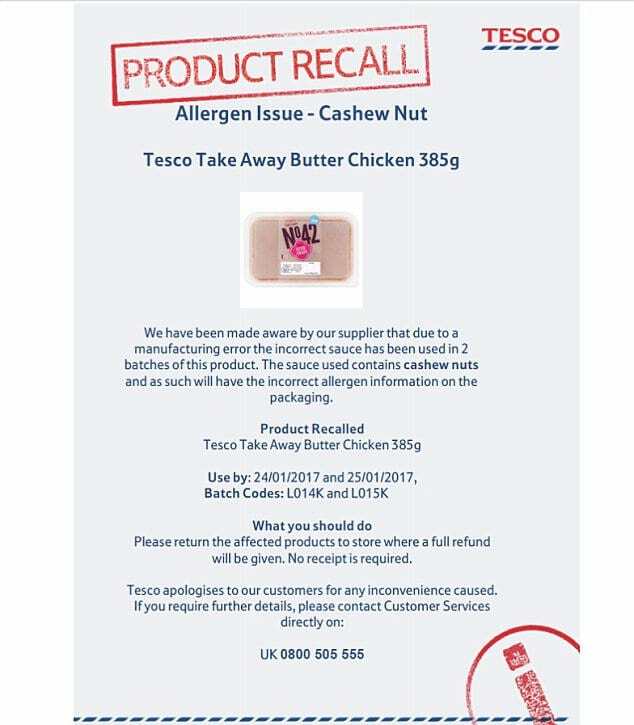 Tesco is recalling the above product from customers and has contacted the relevant allergy support organisations, which will tell their members about the recall. The company has also issued a point-of-sale notice in stores. If somebody who has an allergy to cashew nuts consumes them then it can, in some cases, prove to be fatal. We have been made aware by our supplier that due to a manufacturing error the incorrect sauce has been used in two batches of this product. The sauce contains cashew nuts and as such will have the incorrect allergen information on the packaging. Olympic runner, Usain Bolt has been stripped of one of his gold medals. 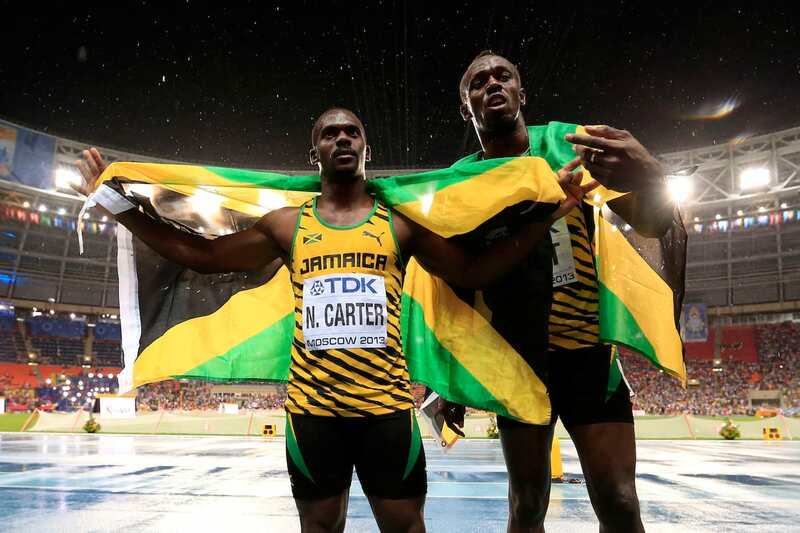 Usain Bolt will have to hand back one of his nine Olympic golds after his Jamaican teammate Nesta Carter tested positive for a banned substance. Both athletes ran to victory in the 4x100m at the Beijing Olympics in 2008. According to the BBC, Carter’s was one of 454 selected doping samples retested by the International Olympic Committee (IOC) last year. It has been found to contain the banned stimulant methylhexaneamine, which is only slightly more powerful than a cup of coffee, according to University of Toronto kinesiology professor Greg Wells. The athlete, Nesta Carter is found to have committed an anti-doping rule violation pursuant to the IOC Anti-Doping Rules applicable to the Games of the XXIX Olympiad in Beijing in 2008… [Nester] is disqualified from the men’s 4x100m relay event in which he participated upon the occasion of the Olympic Games Beijing 2008, has the medal, the medallist pin and the diploma obtained in the men’s 4x100m relay event withdrawn and is ordered to return same. The Jamaican team is disqualified from the men’s 4x100m relay event. The corresponding medals, medallist pins and diplomas are withdrawn and shall be returned. This news will come as a devastating blow to Bolt, whose illustrious and unprecedented record of the ‘triple triple’ – winning three golds at each of the three Olympics in which he’s competed – will officially be taken away from him. It’s morning and you do not want to get up out of bed; Have you spent a long night and still feel sleepy. But you know that you can not skip training. We make it easy to lock. Below you will find exercises to do every morning, in your home, without having to go to the gym, according weekdays. 10-minute exercises help you to strengthen all your organs. Exercises that help you burn fat. Yoga in bed will relax and improve your body. Again should do yoga for about 11 minutes. You will remove the anxiety of the morning and will have many positives to carry the day.